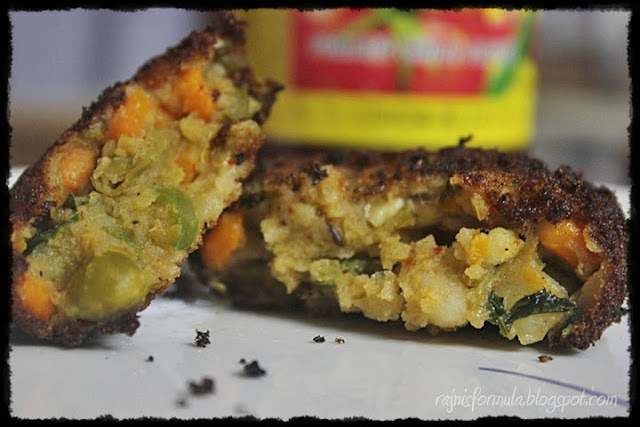 Vegetable Cutlet is a great idea for an evening snack or a starter for a meal. And if you are cooking for children, it’s a good way to include vegetables in their meal. Deep fried items always get a thumbs-up from everyone. Vegetable cutlets are no different, though health-conscious people may shallow fry the cutlets. Shallow-fry may be time-consuming, hence not recommended while making in large quantities. The H keeps talking about the cutlets of Indian Coffee House and how he used to relish them, back in Kerala. Keeping that in mind, one fine happy evening I made these cutlets as a surprise for him :) These are not the exact same as Indian Coffee House. They seem to have Beetroot farms of their own. 😮 In every single item they add beetroots, including Masala of Masala dosa. My recipe is minus the beetroots. 1) Pressure cook vegetables for one whistle with minimum water. 2 cups of mixed veggies chopped - Carrots, French Beans, Green Peas, Capsicum, Sweet Corn and 2 medium sized Potatoes. Drain water from the veggies. Toast 3-4 bread slices, cut them into small pieces and grind them in a mixer. Bread crumbs are ready! Why buy bread crumbs just to avoid this simple procedure! Add chaat masala, coriander powder, aamchur powder, salt, chopped green chillies, coriander leaves and mix well. Grease your palms and make balls out of this mixture and flatten them to make a medium sized patty. Take 2 tbsp maida and add around same quantity of water to this to make a paste of a consistency like oil. Dip the patty into this, and turn the patty so that both the sides are covered with the maida paste. Immediately place the patty onto the bread crumbs and coat both sides with it. Refrigerate the patties for an hour or so, this will firm them a bit. (This step is optional). Serve hot with tomato ketchup/green chilli sauce. The best thing about vegetable cutlets is that it’s tasty even without chutney or any accompaniment. Ah! It would be amazing with a cuppa tea! Another thing, you may freeze the cutlets after coating them with bread crumbs and fry whenever required for 2-3 days. Just remember to thaw (defreeze) them for half an hour before frying.